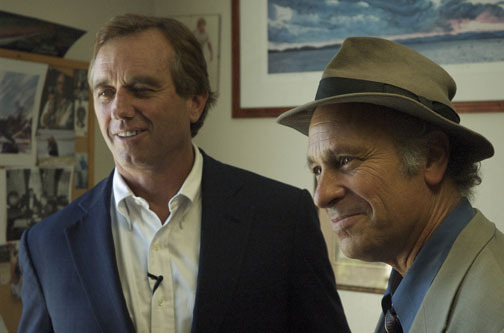 By Greg Palast and Robert F. Kennedy Jr. Some pinheads think that if they get a “provisional,” “affidavit” or “placebo” ballot, they should just walk away and not vote. NO NO NO NO NO. Read what voting rights attorney Bobby Kennedy and I have posted again and again. Fight, but don’t bite. But if you’ve exhausted your options, vote it and track it, if possible. In 2008, EAC records indicate 767,023 provisional ballots were cast and thrown in the garbage out of 2.1 million cast. That is, the chance your provisional vote gets tossed out is roughly 36.5%. So, follow our advice below on how to Vote Unconditionally, not Provisionally. This is #4 of the 7 Ways to Beat the Ballot Bandits. Download and get the whole set””Protect Your Vote with this no-cost ballot condom. Note: If you’re white, you’ve probably never seen a provisional ballot. But don’t take chances. 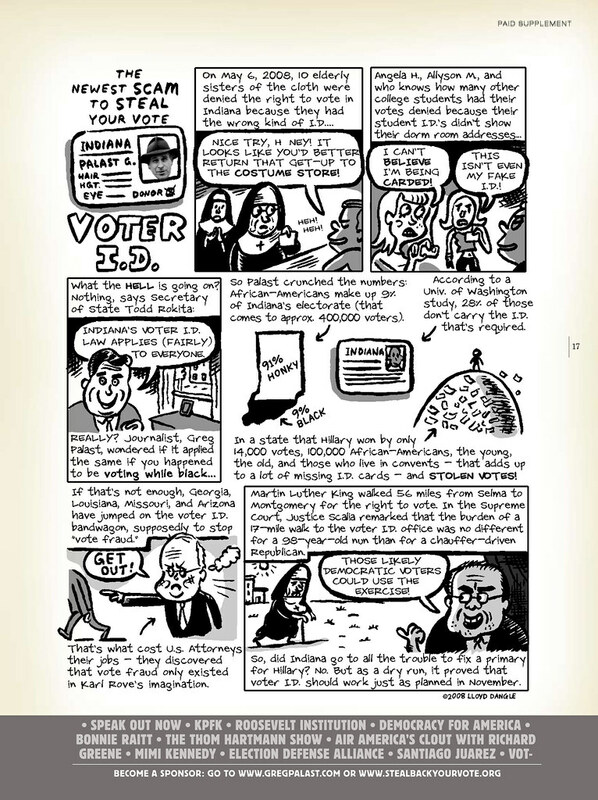 You can find out all the other ways to Steal Back Your Vote by getting a copy of our FREE comic book at the link – http://bit.ly/SBYVComic. It’s not about a candidate, it’s about counting the votes. Whether you’re #withher or #StillSanders – you damn well should care if they count every last ballot. Hundreds of thousands of Americans received provisional ballots this primary season and chances are they won’t be counted. So you’re going to need to Steal Back Your Vote. Watch this short video of my speech at the Still Sanders March, introduced by Cary Harrison in Los Angeles earlier this week. [Phoenix, AZ.] Don’t be fooled. The way the media plays the story, it was a wave of racist, anti-immigrant hysteria that moved Arizona Republicans to pass a sick little law, signed last week, requiring every person in the state to carry papers proving they are US citizens. What moved GOP Governor Jan Brewer to sign the Soviet-style show-me-your-papers law is the exploding number of legal Hispanics, US citizens all, who are daring to vote — and daring to vote Democratic by more than two-to-one. Unless this demographic locomotive is halted, Arizona Republicans know their party will soon be electoral toast. Or, if you like, tortillas. In 2008, working for Rolling Stone with civil rights attorney Bobby Kennedy, our team flew to Arizona to investigate what smelled like an electoral pogrom against Chicano voters … directed by one Jan Brewer. Our concern is not partisan. We need every American to vote: Democrats and Republicans. You can do all the campaigning you want in a battleground state like Ohio or New Mexico, but if your voters aren’t counted, you’re going to lose the Presidency”“and our democracy. Rachel Maddow calls the investigative comic book “really cool.” Download it now for free at StealBackYourVote.org or pick up some print copies and support the Palast Investigative Fund. 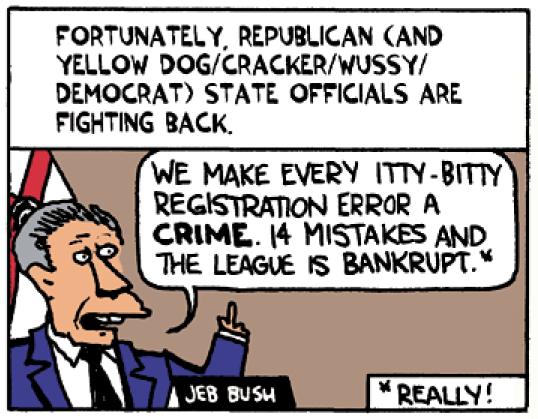 Greg Palast and BuzzFlash go back to the election of 2000. At that time, large progressive political news sites were hard to come by ”“ and there was only one investigative reporter who was able to unravel the theft of the Florida election: Greg Palast. Greg didn’t just expose the mugging of democracy. As a University of Chicago trained researcher, he was able to detail how Katherine Harris used an outside vendor to create caging lists that prevented legitimate voters from casting their ballots. In fact, Greg has a laptop presentation that actually shows you the lists that Harris’s office worked from in keeping minorities from voting. Of course, Greg’s investigation on vote theft ”“ which has branched out widely in the intervening years ”“ is persuasive and thorough enough for the BBC and British newspapers, but not for the corporate press in America! We kid you not. To this day, Palast is effectively banned from reaching the mainstream American voter because television stations and big papers are owned by companies that don’t want to rock the vote. It might hurt their tax cuts or efforts to deregulate media ownership. BuzzFlash thought that now would be a good time to revisit with our most interviewed expert on BuzzFlash, Greg Palast. After all, we have an election coming up. BuzzFlash: You have been investigating the coordinated and vigorous GOP effort to suppress and steal votes since the theft of the election in 2000. You and Robert F. Kennedy Jr. just did a BBC Documentary on what nefarious voter suppression tactics the Republicans have in store for us in 2008. Can you summarize some of the methods that the GOP are using to disenfranchise non-Republican voters prior to the election, to prevent them from voting during the election, and to keep their votes from being counted after the polls close? – In the swing state of Colorado, we found that the Republican Secretary of State wiped out 19.4% – one in five – voter names in an unnoticed mass purge. – In swing-state New Mexico, in the February caucus, one in nine Democrats found their names missing from the voter rolls supplied by the State. The elections supervisor of San Miguel County – whose own name was missing from the rolls – has no confidence the state contractors will fix it. Our statistical analysis showed there was a direct relationship between your name and your race and income. The poor and the dark were disappeared. – In Indiana, you heard about 10 nuns who lost their vote because their ID – drivers’ licenses – had expired (they were all over eighty). But what about the others? We’ve calculated that 143,000 others were turned away – disproportionately Blacks and new voters. BuzzFlash: BuzzFlash has been covering one public relations effort by the Republican National Committee to create a false context for claiming voter fraud. In short, they have been attacking a national community organizing group called ACORN with news releases, lawsuits, surrogate assaults, etc., falsely claiming (as they did in 2004 and 2006) that ACORN is engaged in the massive illegal registration of primarily minority voters. Can you explain the significance of the ACORN slander by the RNC? Greg Palast: As RFK and I report, there are only about SIX voters found guilty of federal voting fraud in a year. SiX! Out of 178 million registered voters. So the GOP (and Fox and CNN) are running stories about ACORN signing up zillions of illegal voters. Yep, there are a handful of phony names – but ‘Mary Poppins’ has never shown up to vote. However, the Republican cry of ‘Vote Fraud!’ has become the cover for purges and challenges to legal voters by the millions. I even tracked down and filmed some of these so-called fraudulent voters handed me from a GOP list. Every one was a legal voter. Tell us a bit about the site and downloadable comic book that you launched with Robert F. Kennedy, Jr. on how to prevent the theft of millions of votes by the Republicans, yet again in 2008. The website is: http://www.stealbackyourvote.com. Greg Palast: Our Rolling Stone report that’s out this week is all about how they’ve stolen so many legitimate votes. The comic book, which includes the Rolling Stone findings also includes the SEVEN WAYS TO STEAL IT BACK. And the whole thing is illustrated brilliantly by comic crazies Ted Rall, Lukas Ketner and Troubletown’s Lloyd Dangle. I loved doing it. You can download the whole comic book for a penny or more (donate more please) at StealBackYourVote.org. And better yet, you can order bunches of the comic book there as well (and see the short movies). Cool eh? BuzzFlash: Can you briefly explain the role of ProsecutorGate at the DOJ in efforts to suppress the Democratic vote in 2006? How did this fit in with Karl Rove’s grand voter suppression and theft plan? Greg Palast: You betcha! Fired prosecutor David Iglesias told us something astonishing: He said that he was fired because he refused to arrest innocent citizens for voter fraud that didn’t happen. That’s obstruction of justice. It was all about creating a hysteria over fraudulent voters that didn’t exist. This is what Iglesias basically said: “They wanted some splashy pre-election indictments [Rove and the RNC] that would scare these alleged hordes of illegal voters away.” Only the voters were legal. BuzzFlash: Isn’t there one bright spot? You cut your teeth on GOP voter disenfranchisement with brilliant reporting on how the Bush campaign team, Jeb Bush, and Katherine Harris prevented tens of thousands of valid minority voters from voting through a scheme to use an outside vendor, ChoicePoint, to create an inaccurate list of felons who could not vote in 2000 in Florida. Hasn’t the current GOP governor, Charlie Crist, had the right to vote of ex-felons restored? Greg Palast: Crist is a duplicitous phony. On the one hand, he pretends they’ll let ex-cons vote as in almost every state. On the other hand less than a handful of the half million ex-cons in the state have been able to get through the insane rigamarole required to actually register. In most states ex-cons can vote like anyone else. BuzzFlash: As a follow up, from a practical matter, don’t the Republicans have to be within a certain striking distance to steal the election. If Obama keeps trending up, or ends up with a double-digit popular vote victory, how could the GOP steal the election? After all, if Nader weren’t on the ballot in Florida ”“ despite all the nefarious Republican voter suppression and theft ”“ Al Gore would be president, right? Greg Palast: That’s what RFK and I say: you can’t steal ALL the votes ALL the time. BuzzFlash: Okay, it’s less than a month before the election, what can anyone do to halt another theft of the White House? BuzzFlash: For 8 years, you’ve been covering this issue. Some others have joined you over time and it’s a bit of a movement, albeit still relatively small. But, as in 2000, not much has changed with the corporate media. They are still pretty much ignoring the clear evidence of a coordinated GOP effort to keep non-Republicans from voting and to steal votes wherever they can. Is there any reason to think that they might awaken to their journalistic responsibility to report on the mugging of democracy? Greg Palast: Zero. That’s why we have BuzzFlash. Bless you. BuzzFlash interview conducted by Mark Karlin. WHAT’S THAT UP IN THE SKY?! It’s Bobby Kennedy and Greg Palast releasing the flaming hot full-color investigative comic book, STEAL BACK YOUR VOTE! Pow! Zap! No more joking with our rights, Mr. Rove! Click here and get the 24-page investigative comic book by Greg Palast and Bobby Kennedy: STEAL BACK YOUR VOTE. With the full story of the investigation you’ll soon see Rolling Stone magazine – illustrated by razor-sharp pencils of Ted Rall, Lukas Ketner and Lloyd Dangle. SIX ways they’re STEALING your vote – and SEVEN ways to STEAL IT BACK. Make a $100 tax deductible donation at StealBackYourVote.org and we’ll send you 25 to pass out to troublemakers of your choice. And, for every $100 donation, we will give away another 400 to voters to vulnerable voters in swing states. We just sent eight cases to Santiago Juarez. Santiago’s working with young Hispanic voters of New Mexico. Can you help us send him more? Or donate $75+ and get a half dozen comix plus the DVD, ‘The Election Files’ – my BBC reports on the vote snatchers. Pick up 10 copies of the guide for a donation of $50. We send’m right away by priority mail. Get five hundred copies for your local school or group for a $1000 donation at http://www.palastinvestigativefund.org/print-copies-of-steal-back-your-vote. Or give us the donation, we’ll send’m to a church designated by our co-sponsor Jesse Jackson’s Operation Rainbow/PUSH. Or you can download the comic for a donation of a penny or more (more, PLEASE), at StealBackYourVote.org. Spread this link! Pow! Zap! Take that, Katherine! Steal Back Your Vote is a project of the not-for-profit non-partisan Palast Investigative Fund. WHAT’S THAT UP IN THE SKY?! It’s our Super Sponsors! Voto Latino, Operation Rainbow Push, Air America Radio, Juan Gonzales of Democracy Now! and other crusaders for Truth, Justice and the American Way. Contact us at interviews (at) StealBackYourVote.org. “A lot of Europeans wonder: Why are Americans so crazy, they keep reelecting this guy?” Well the answer is, we don’t! They keep stealing these elections! And they stole it in 2000, they stole it in 2004, and they’re all set up to steal it again!” – Robert F. Kennedy Jr. on BBC Television Newsnight. Or watch it, beginning Friday night, at www.Gregpalast.com.